Mimas Eclipse - Solar System Planets And Moons Section. Cassini sees Mimas eclipse Janus. NASA's Cassini spacecraft was recently in a lucky position in space earlier this month to watch its own private lunar eclipse, as one of Saturn's moons (Mimas) passed in front of another (Janus). Cassini's camera was rolling the whole time, and the spacecraft captured 37 images that have been stitched together into a movie of the event. Some large terrain is visible on Mimas, including its gigantic crater (the one that makes it look like the Death star from star Wars). Saturn's icy, impact-riddled Moon Mimas slips briefly in front of Saturn's Moon Janus in this movie from Cassini. Mimas is 397 kilometers (247 miles) across, while Janus is 181 kilometers (113 miles) across. The movie was created from 37 original images taken over the course of 20 minutes as the spacecraft's narrow-angle camera remained pointed toward Janus. 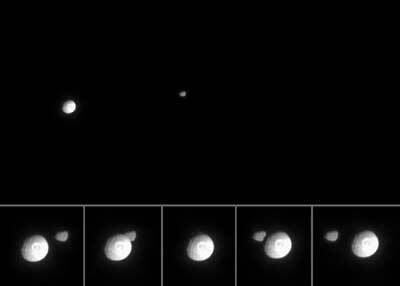 Although Mimas moves a greater distance across the field of view, Janus also moved perceptibly during this time. The images were aligned to keep Janus close to the center of the scene. Additional frames were inserted between the 37 Cassini images in order to smooth the appearance of Mimas' movement - a scheme called interpolation. Close-up images from the few minutes surrounding the occultation are arranged into a strip along the bottom of the movie. The terrain on Mimas seen here is about 80 degrees west of the terrain seen in a previously released movie (see Mimas on the Move), which showed the little Moon appearing to cross Saturn's ring plane from Cassini's vantage point. In that previous movie, the rim of the large impact crater Herschel (130 kilometers, or 80 miles wide) was visible as a flattening of the moon's eastern limb. In the new movie, Herschel is almost at dead center. Contrast on Janus was mildly enhanced to aid the visibility of its surface. The right side of Mimas appears bright because the Moon was partly overexposed in this image sequence. The images for this movie were taken in visible light on March 5, 2005, when Cassini was approximately 1.8 million kilometers (1.1 million miles) from Mimas and 1.9 million kilometers (1.2 million miles) from Janus. The image scale is approximately 11 kilometers (7 miles) per pixel.